If you missed last week’s post about taking care of your physical health, check out the SWEAT self-care checklist for forming healthy habits. You can find a self-care checklist for forming balanced creative and inquisitive habits here, and a free checklist for creating habits for mental self-care. The key to remember with all habit-forming plans is to start small. Choose one habit, and once you’ve developed it, add another one. I don’t know about you, but I know I’ve fallen victim to short-circuiting my spiritual self-care habits from time to time. Developing and maintaining a personal relationship with the Almighty looks and feels a bit different from developing and maintaining a relationship with a human being. After all, we know how easily we can let our mortal relationships fall into a rut. And we can see and talk to people. So, whether you feel like you and God have an established relationship, or you feel like you want to start all over again, the acronym PRAY will help you remember the essential elements to keeping your relationship with God fresh. Just writing that exhausted me. When you have a conversation with God, don’t wear his name out. When you phone a friend, what do you say? When you love someone, how often do you talk to that person? Do you only talk to that person when you need something? You get my point. Make a habit of talking to God daily. Do your own study of what the Bible says about prayer. I have a prayer journal that I use each morning, but I pray all day long as things come up. When I see a beautiful rainbow over a stormy desert, I thank God for beauty. Maybe a student acts up in class, and I’ll shoot a prayer heavenward asking for wisdom and restraint. As your relationship with God deepens, you’ll find that prayer becomes second nature. You won’t have to think about it. Just like you don’t have to think about talking to your family. In order to have a quality relationship with someone, we need to spend focused, quality time with that person. Likewise, if we want to have a quality relationship with God, we need to spend focused, quality time with God. That doesn’t mean we need to spend hours on our knees in church and sign up for every community service project the church ladies send our way. It does mean learning about Sabbath rest and its importance in our lives. Without weekly Sabbath rest, we can fall into the busy trap that stifles our growth. Resting also means that in our daily conversations with God we spend time just listening. After all, a conversation with an earthly friend that involves the other person talking non-stop and then hanging up abruptly doesn’t feel very satisfying, does it? Michelle DeRusha’s book True You has guidelines for ‘directed rest’—five minutes of silence that can help you learn to rest and listen to God’s side of the conversation. Spiritual self-care requires that we learn to rest in our relationship with God. We don’t use the word ‘abide’ much these days. It has several meanings—most of with don’t fit in well with today’s on-demand society. As a transitive verb, it means to bear patiently, or tolerate; to endure without yielding; to wait, or to accept without objection. In the intransitive form, it means to remain stable or fixed; to continue in a place. Let’s look at both forms of abiding. When tragedy hit, I had two choices. I could haven thrown my relationship with God out the window because he let my husband get cancer. Or, I could choose to abide in him and know that he would help me through each step of the journey. Abiding doesn’t come easy. Who wants to tolerate cancer, bear patiently while a loved one suffers, or accept an almost certain death sentence? But I clung to the promise God made to abide with ME. I might not understand his plan, or how he can use my suffering for his glory, but I can abide because I know he will. Neither cancer, nor suffering, nor mental illness, nor job loss, nor circumstances I don’t understand can separate me from the love of God. The opposite of abiding is stewing—constantly worrying about a situation that seems unsolvable. I make a conscious effort to pray about my worries. Instead of listing my woes, I list the ways God has provided in the past. It makes it easier to abide. Yield is one of those cool words in English that means two completely different things. On the one hand, it means to surrender and give up. On the other, it means to produce. If we want to nurture our spiritual side, we have to learn how to do both. The surrendering type of yielding does NOT come naturally for me. I like to get my own way. Winning can quickly become everything for me. My parents claim that my first sentence was, ‘No! Do it myself!’ as I pushed their helping hands aside. My journey to yielding more to God and less to my impulses hasn’t ended, because I struggle with it daily. I prefer to spend time and money on myself—but God didn’t give me those gifts for my own gratification. And so, I make a practice of giving of my time and money to other people that he puts in my life. I try to cultivate an attitude of ‘my way is not the only way, or even the best way—it’s just the way I prefer.’ Once again, I struggle constantly with this attitude. The more I yield to the Holy Spirit and give up my own preferences, the more I realize that by yielding I open myself up to new experiences and relationships. And when we allow God to use us as HE sees fit, we suddenly realize that our lives can produce a whole lot more. More grace, more love, more empathy, more ideas on how to help others. Don’t let anyone fool you. 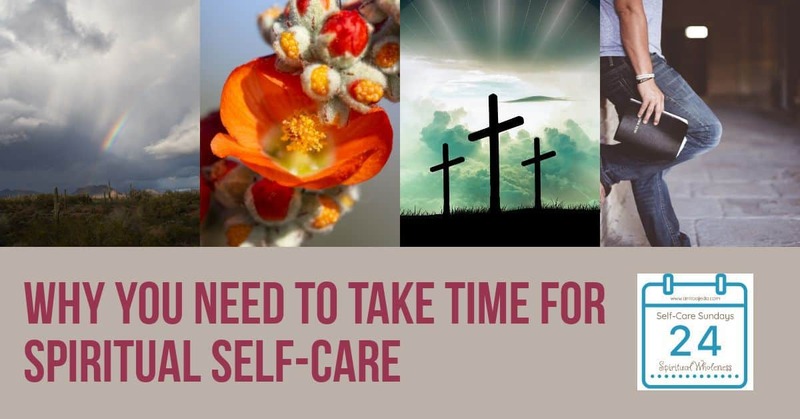 Self-care doesn’t mean the same thing as self-indulgence. A program of focused self-care means that you care enough about you as a person that you take time to nurture and explore who you are. Sure, having a mani-pedi occasionally or splurging on a new purse make great rewards for making progress—but those things won’t sustain you over the long haul. Your fingernail polish might chip the next day, and your purse could clash with all your clothes. But taking time to nourish who you are and strengthen your relationships with your self, your humans, and your God will pay lasting dividends. Thanks for sharing, my friend! I’ll be pinning and tweeting! I like the acronym you use Anita. Tea With Jennifer recently posted…Retreat! Retreat! This is a great checklist! It can be easy to neglect the spiritual aspect of self-care at times. And I hadn’t thought before about the two meanings of “yield.” It’s a great reminder of how surrender and fruitfulness are tied together! Prayer is my greatest challenge of all the spiritual disciplines. Thank you for emphasizing it here as part of our spiritual self-care. I know it makes a difference. All good advice. What particularly stood out to me this morning were the two sides of “yield.” I’ve often thought of and prayed for the grace to yield in the sense of surrender. I’ve thought of it like the traffic sign: letting the other person (God, in this case) have his way. But I hadn’t thought of it in terms of yielding a crop. Rich food for thought! This stands out the most to me: “Neither cancer, nor suffering, nor mental illness, nor job loss, nor circumstances I don’t understand can separate me from the love of God.” We’ll always have trials of some sort or another. But they are never bigger than God’s love for us. Thanks, Anita! Thanks Anita, abide is a good word, to settle down, snuggle up to Jesus, I think yielding to His Spirit is what sometimes throws us, it is not easier to worry and still we do. Yes, spiritual care is crucial to our well being. Unfortunately, it can be the easiest to skip. What a difference it makes when I have a habit of communing with God first thing in the morning. It seems to keep the conversation going all day. Such a simple acronym with a powerful message. I find that I hear often the importance of rest and it is an area I don’t always do well at. I realize that it is the slowing down and choosing silence that can trip me up at times. Thank you for such practical wisdom. I know when I haven’t done well with spiritual self-care…but I am so thankful that our God is a God of grace – unending grace. And He is faithful to help us get back on track. I’ve shared this post on Pinterest.